I’ve received a gift from one of my readers: a new banner for my blog! Isn’t it gorgeous? Place the butter, sugar and vanilla in the bowl of an electric mixer and beat until light and creamy. Add the egg and beat well. Sift over the flour and baking powder and mix to form a smooth dough. Roll 1 leveled tablespoon of the mixture into a ball and place 2.5cm (1in) apart onto prepared sheets. Repeat with the remaining dough. Bake for 10 minutes, remove from oven, and then using the end of a wooden spoon make an indent in the center of each cookie. 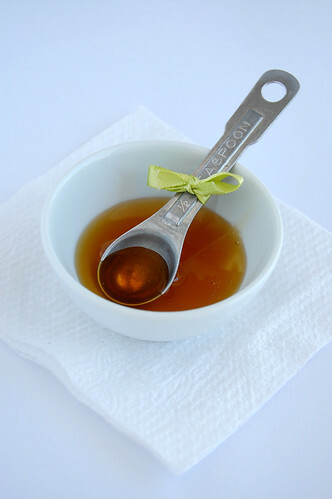 Fill each indent with ¼ teaspoon of honey, return to oven, and bake until light brown on the edges, 7 to 9 minutes more. Remove to a wire rack to cool. the new banner is lovely! These cookies are so pretty. I never thought to add honey to drop cookies before. Love the new banner. The cookies look delicious. I love thumbprint cookies but never thought of using honey. I love it!! So crisp and simply beautiful! They look lovely, Patricia. Sweet and simple - just how I like them! Great new banner, Patricia - it looks lovely. Good work, Samanta. I love these - it's like thumbprint cookies with extra sweetness. Mmmm, honey cookies! These sound so good. Kirbie, I have tried thumbprint cookies with chocolate and lemon curd, and was very intrigued by this honey version. Wizzy, I hope you like the recipe! That honey sounds so precious! Katie, thank you! I have got to try them with jam, now. Sunday, tks for stopping by! A Forkful..., I hope you like them, too, sweetie! Pat! Estou aqui tambem, e não é que gostaram mesmo? :D que bom!!!!!! Your new banner looks great! 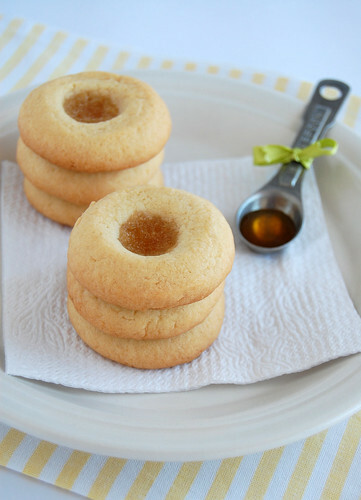 I'm so interested in these cookies - I just love how they're like a thumbprint cookie but instead of jam you put a bit of honey. They look amazing! One question - you have to fill the cookies after baking them? Will they be soft enough to make an indent in them? Isn't it safer to make a whole in them before baking? Buncia, tks for stopping by! If you make the whole prior to baking them the first time the dough will rise and the whole will disappear.